A look at the match that has been called the “greatest British pro wrestling match of all time” (Mark Haskins vs. Will Ospreay). Where does Atlantis vs. La Sombra fall in regards to 21st century mask matches? We are offering two versions of this e-book. If you haven’t checked them out already, catch up on the previous editions of the 2015 Match Guide. 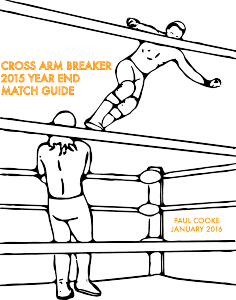 All previous seven monthly editions of the 2015 Cross Arm Breaker Match Guides can be downloaded here. The special G-1 Climax edition can be downloaded here.